Goodness, Sammy: you look SO official. First an FBI agent and now the President!! WOW. No President’s Day shopping for my family today. Motor Mommy has to be fitted for a crown – a dental one, not one for her head! If she needs a little TLC this afternoon when she gets home, I will be right there: Nurse Sundae. Oh Sundae I bet you’ll look adorable in a nurse’s uniform (hubba hubba). I’m sure you’ll take super good care of your Mom after she gets home from the yucky old dentist. So you like my Presidential photo huh? I’m thinking it would just be way way way too much trouble to try and run this country so I’m rethinking that whole thing. Besides, it would interfere with my FBI work…..a guy’s gotta do what a guy’s gotta do! Have a great day – at least you do’t have to worry about someone coming to deliver a package today! Hi Miss Linda! Thanks for the compliment but I do think I’d have looked better in this photograph if my hair had been RED instead of BROWN. I agree – taking care of this country is a bit out of my “scope”….I think I’ll stick with my FBI work and taking care of my parents….PERIOD. I hope you have a fabulous holiday, even though I know you’ll be working hard to keep your parents in line! Aloha Pedro! Yeah – I definitely think that photo would look better with my natural color vs. that brown stuff plopped on my head! The only thing about The Donald that I wish I had wouldn’t be his hair but I sure wouldn’t mind having his MONEY! Tee Hee – then I could come visit you and learn to surf! You do look handsome behind that podium, Sammy!!! But I agree about running the government. Besides you have a full-time job managing your household AND your FBI duties!! You wouldn’t have time! You’re right Miss June………and considering the state of things, government-wise, it would be a whole lot of work wouldn’t it??? I’m sticking with being an FBI agent and taking care of my parents. That’s enough for one spoiled cat! Shoot! That’s right…no mail delivery and just this very minute I sent Jake (who’s on “Mid-Winter Break”) down to the mailbox to leave a bill payment for pick up! Here he comes back…lol. He’s gonna kill me. Uhoh Miss D…..something tells me Jake will be forgiving you for that trek down to the mailbox….I expect he’d do ANYTHING for his Mom just like I would!!!!! Happy Prez’s Day to you too! Yeah well, at least you’re smart enough to know you don’t want the job…. the ones running seem to be listening to their egos instead of their common sense! Wes is having a holiday too! Its called “Winter is too long in the Great White North so we are giving yous a day off Day”. Um Nellie, Mommy here, It’s called Family Day! Me thinks yous would make a great President, however, yous right, ruling a household and the FBI is a lot of work for a cat! Hi Nellie….I have thought long and hard (well, hard anyway) about the Presidential thing and I’ve decided that if I’m going to pursue my Feline Bureau of Investigation career, I just won’t have time to be in charge of this place TOO. Besides – it’s lonely at the top so they say. Sammy I would vote for you to be President any day! Cat nip for all!!! Hi Cody! Thanks for the vote of confidence – it’s probably the ONLY vote I’d get of ANY kind! 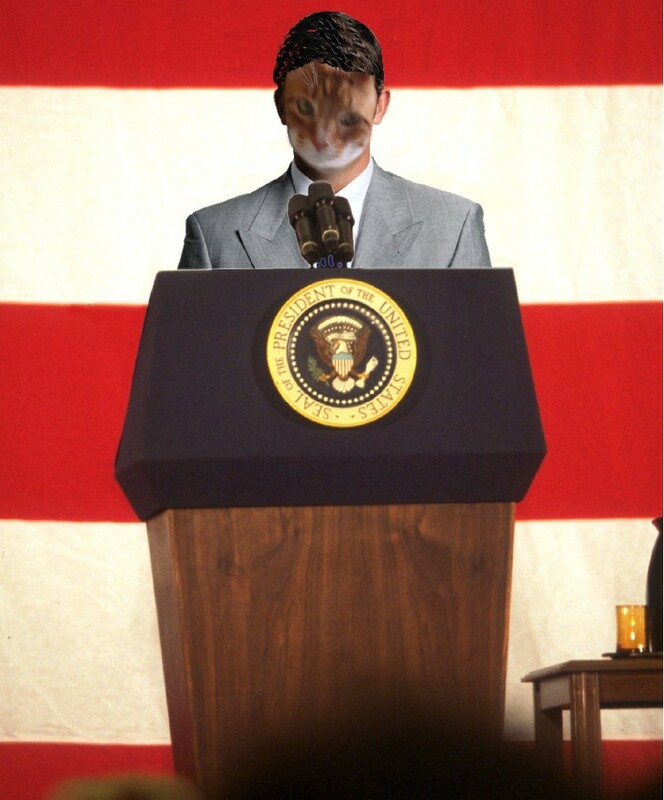 HAHAHAHAHA I do like that slogan suggestion though….Catnip for All would certainly bring in the feline vote huh? 😦 Wait a minute – do you really think your BFC wouldn’t vote Sammy for Prez??? I’m hurt… Except that you’re right, I wouldn’t. ‘Cuz I’m not old enough yet. But Kitty will be 18 for the elections, and I know she’d vote for you. Oh Pedro, I’m SURE you would have voted for me had I run for the oval office – I decided though to stick with the rectangular litterbox instead. Running this country would have given me a huge headache. I’m sticking with what I know how to do for sure – running this household! Sammy, work is over-rated; better to stay home and nap! You’re totally right…….work is over-rated but there’s no such thing as over-rating a good solid NAP!